Drove south to Sosussvlei, only accessible with a 4x4, unbelievable scenery, Stef for once was speechless. We drove for approx. 6 hours, covering 300kms over mostly dirt track, the kids took the journey in their stride. We stopped at the only fuelling station en route, at this stop it is said that you must stop for fuel and apple pie, the fuel was good and the apple pie was fantastic, not as good as Momo Chris's, according to Floss and Max. We arrived at Sosussvlei Lodge, next to the entrance to the dunes at 5pm. The kids were straight into the unheated swimming pool, on the edge of the Namib desert. Watched the spectacular sunset, and then enjoyed a desert feast, which included Kudu, zebra, springbok, hartebeest and wildebeest, happy days! then back into our accommodation which is half bungalow half luxury tent, even Floss can rough it! Early wake up call 6.45am to see spectacular sunrise and then dune running. 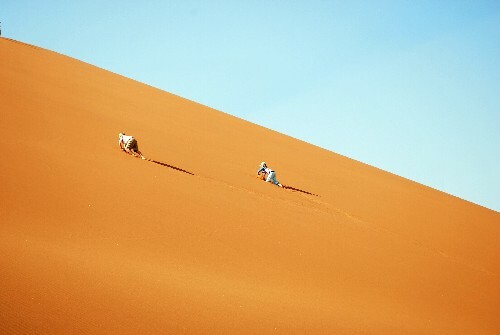 Views are fantastic, the sand dunes are the largest most stable dunes in the world. The highest reaching 300m. Sosussvlei is in the Namib desert which is the oldest desert in the world. After 2 nights we leave to travel on to Swakopmund, on the west coast of Namibia, approx. 300kms of dust track. Approx half way we cross the Tropic of Capricorn, an excellent time for a bit of Geography for FM. After a tough drive which nearly saw the separation of the canopy from our truck, due to extensive continuous vibration from the road surface, we arrived in Walvis Bay for a late lunch. At this beach we saw the largest dustbin lid size jelly fish. Last part of our trip to Swakop, only 35kms and arrival at our hotel, Schweitzerhaus. Swakop was quiet, Floss did her first bit of haggling but only got five dollars knocked off. She's got some learning to do! On Tuesday we picked up some sheets of dune board from a petrol station and a jar of polish and headed down to the dunes between Swakop and Walvis. We had a great time flying down the slopes. FM loved it! Wed 10 Sept. Left Swakop for cross country drive towards Etosha. Amazing across the desert, first completely barren then a few low bushes, more vegetation as we drove inland. Overnight at Vingerklip Lodge set amongst sandstone cliffs stuck up our of the ground. A few giraffe and kudu. They also had a small restaurant outpost stuck on top of one of the cliffs where we went for a sundowner - amazing views. Thursday we drove the last 200kms to Etosha National Park, stopping for excellent Kaffee & Kuchen at the Baeckerei in Outjo. Three nights in Etosha, great game viewing. Thousands of zebra, springbok, kudu. We saw at least 50 elephant, 20 Giraffe, also 5 rare Black Rhino. The only elusive creatures were the lions who were clearly too scared of Flossie to turn up. Finally we saw a lioness dozing under a tree on our way out of the park on Monday morning. Drove out and headed east to Tsumeb, where we are now preparing for our travels northeast towards Botwsana and Victoria Falls.